Get around safely with steel crutches. These bariatric crutches are constructed of steel to reliably support your weight and keep you moving. Most are adjustable to the height most comfortable for you and can withstand 500 pounds or more. 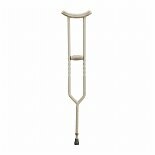 Find steel crutches from Drive Medical or Nova here at Walgreens.com for a simple mobility solution. When you choose your steel crutches, look for the extra accessories that can increase your comfort. 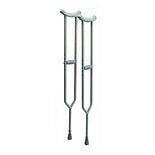 Find crutches that have padded underarm rests and hand grips in addition to durable tips. You can also find crutch pillows for more padding. If you need to replace the grips, tips or padding, there are replacement products you can purchase to extend the life of your heavy-duty crutches. Browse our other mobility equipment to view all of your options. Our selection of home medical supplies and equipment includes bariatric wheelchairs, rollators and canes. A heavy-duty walker can provide a stable framework to support you indoors and outdoors. Bariatric rollators include a seat that allows you to stop and rest as needed. Heavy-duty canes are easy to use and convenient to transport.